After a pretty long time, I am back on YouTube once again and yes I uploaded my second collective haul video after a pretty long time. I hope you going to enjoy it while watching it. P.S. Kindly pardon my flaky hands as I am peeling badly nowadays due to weather change in Noida. TBC BY NATURE PEELING GEL SCRUB (PR SAMPLE). MAC NUTCRACKER SWEET COLLECTION (INSTAGRAM SELLER: BEAUTYBUYINDIA). ALEXIS X COLOURPOP TOPAZ PALETTE (INSTAGRAM SELLER: INTERNATIONAL_MAKEUP). TOO FACED WHITE CHOCOLATE PALETTE (WON IN A GIVEAWAY BY INSTAGRAM SELLER: MAKEUPANDBEAUTYSTORE NOW NAMED ASBEAUTYLICIOUS_INDIA). MAKEUP GEEK EMPTY PALETTE & ALL FOILED EYESHADOWS (FROM BEAUTYBAY.COM). JUVIASPLACE MASQUERADE PALETTE (MINI) & NUBIAN 2 PALETTE (INSTAGRAM SELLER: BEAUTYSHOP_INDIA). MAC TARAJI P. HENSON LIPSTICK (REVIEW IS UP ON BLOG HERE ). WET N WILD HIGHLIGHTING POWDER (BY SOFU). LAKME 9 TO 5 LIP AND CHEEK COLOR IN SHADE COFFEE LITE. KIKO MATTE 4 YOU COLLECTION: BLUSH DUO (RS.1150), LIPSTICKS ARE IN SHADE 02, 03 (RS.800/- EACH), MATTE 4 YOU BRUSH (RS.1500/-). WET AND WILD MEGA GLOW STICK (GIFTED BY FRIEND). WET AND WILD METTALIC LIQUID LIPSTICK (GIFTED BY FRIEND). 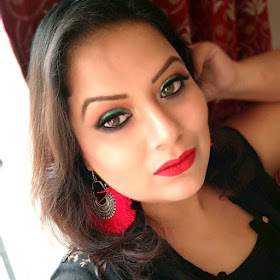 JEFREESTAR COSMETICS LIQUID LIPSTICK GEMINI 9FROM BEAUTYBAY). COLOURPOP HELLO KITTY LIPPIE STIX DATE MATE (INSTAGRAM SELLER: SHOPYOURADDICTION). COLOURPOP HELLO KITTY ULTRA MATTE LIP RIBBON (INSTAGRAM SELLER: SHOPYOURADDICTION). COLOURPOP ULTRA MATTE LIP SUNDAY (INSTAGRAM SELLER: BEAUTYBUYINDIA). COLOURPOP ULTRA MATTE LIP MONDAY (INSTAGRAM SELLER: INTERNATIONAL_MAKEUP). COLOURPOP LIPPIE STIX IN SHADE SECRET STASH, GOAL DIGGER, SAUCE, MIRROR (INSTAGRAM SELLER: COSMETIC 2492). P.S. After so much request finally I am openly recommending few Instagram seller from whom I shopped it is not a paid post by Instagram sellers whom I mentioned in my video neither I am forcing you all to shop only from them. As I was getting so many queries regarding my haul and Instagram sellers from whom I shop so I thought to open up this time. So any mishap happens with you for these sellers kindly do not be held MnB responsible for it as I have good experience with them and I never had any problem with them.